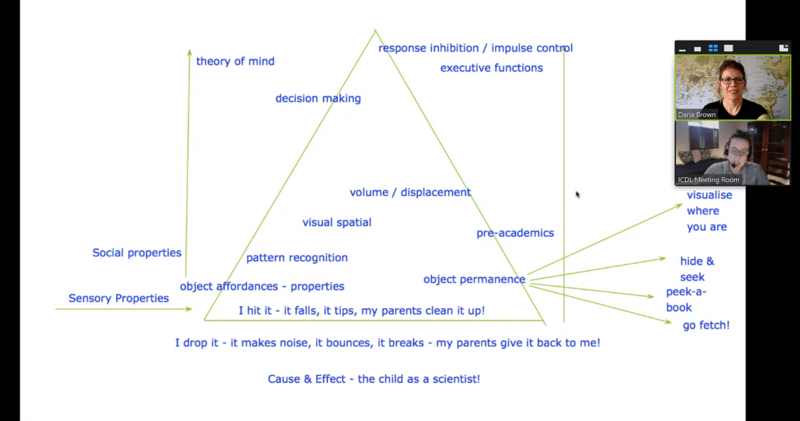 Virginia Spielmann returns this week to discuss cause-and-effect play. Virginia is a Developmental, Individual differences, Relationship-based (DIR) Expert Training Leader, a clinical consultant for the Interdisciplinary Council on Development and Learning (ICDL), an occupational therapist currently working on her registration in the state of Colorado where she is now the Associate Director at the Star Institute for Sensory Processing Disorders, and a PhD candidate in Infant and Early Childhood Development at Fielding Graduate University. This interview stemmed from a discussion in my Supporting Floortime Families online group that Virginia attended as a guest speaker. I was talking about my concern that our son has been ‘in cause-and-effect play’ for at least four years and that the robust imaginary play stage had not yet begun. Virginia had some wonderful feedback for our group that I wanted to share with this audience. I started, in the video or audio podcast above, by describing some of the cause-and-effect play my son engages in. It might just be his version of knitting or doing a puzzle… doing an activity to get your thoughts in order… to be regulated… to be calm… This is where he gets order: from this experiment that seems a little bit repetitive. Virginia says that she heard me say that these activities “don’t feel functional“. Instead, she hears me describing a little scientist exploring his world, using experiments, looking for outcomes and recording his data. He’s exploring the properties of objects, thinking about how a liquid changes when the solid can has liquid coming out, exploring volume which is a pre-numeracy skill, learning about visual-spatial relationships which not only feeds into pre-academics, but also feeds into his motor planning ability–all possibilities that the environment affords you in movement, play, and responding to things as he makes a plan. Is it a sign of (dys)regulation? Is it a way of getting regulated? We’re not trying to normalize our children. We’re trying to help them be their authentic selves. In the same way Dada needs his coffee in the morning and a bath to wake up his stiff joints, our son might be organizing himself by making discoveries about objects in his environment. This is really about letting go of our pre-conceived notions and expectations about what is functional or not and actually being in the moment and attuning to our child to see what is going on with them. Virginia says this is really about joining our child in play conveying the message that “I see you. You have great ideas. You teach me something right now. Let’s learn about the world together.” This allows our children to be their authentic selves and have a place in this world because they can share joy with us. Hand objects to my son to throw behind the bed and participate in this ‘experiment’ to support his query of seeing what object falls the quickest, what makes the funniest noise, what squishes, what bounces, etc. Our son’s impulsivity has decreased over time in his cause-and-effect play. Whereas he once would have impulsively knocked over a cup of water or coffee, the example I gave earlier was that he slowly, methodically, and patiently pushed the beer can along the table to the edge and paused before knocking it off the table, the whole while glancing at me to see my reaction. I also gave the example of how it moved from self-contained activities to social activities where he will hit or stomp on a foot to get a reaction out of somebody. There is a development to cause-and-effect play. For example, Virginia points out that we are still learning about cause-and-effect in the social realm as adults when we determine how to interact with new people we meet. From sensory play to object permanence to pattern recognition and beyond, Virginia walks through so many stages of cause-and-effect play. 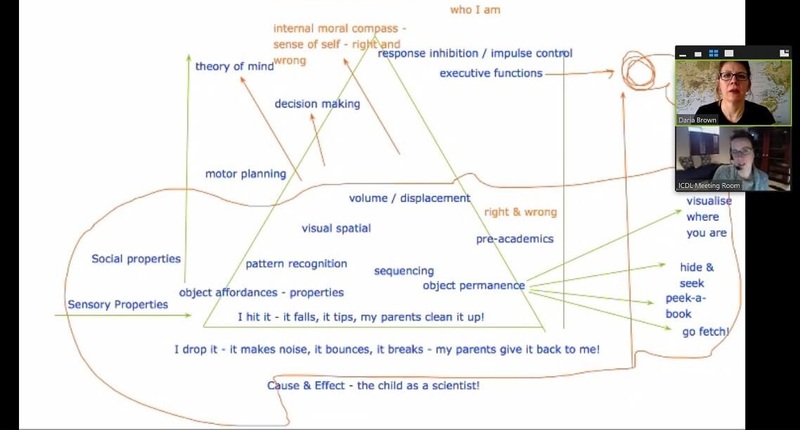 She drew this diagram below and then elaborated on it while describing all of the development that happens from a child as a baby watching an object fall that (s)he knocked over through to theory of mind and more advanced developmental capacities such as playing with moral ideas of what is right and wrong (Click on each image to enlarge). Virginia discusses how important it is to explore cause-and-effect relationships for development that occurs later on to be robust. Although our son has been in this stage of play for many years now, he has been developing capacities that will serve him going forward and rushing him will not benefit him. Please see the podcast with Dr. Gil Tippy about the pre-cursors to academics, Foundation Academics, for more on this topic. If you learned something about how to see your child’s play in a new light and have any examples, suggestions, or thoughts, please share them in the Comments section below. Also, please consider sharing this post on Facebook or Twitter.